A German strudel is a traditional pastry made of thin layers of dough spread with a flavourful filling that is rolled and baked until golden. Our Pear, Nut & Cheddar Strudel combines fresh pears and cheddar cheese for a fresh take on the classic baked dessert. Combine pears, cheese, lemon juice and 1 tsp. cinnamon. Mix remaining cinnamon and trail mix. Stack 2 phyllo sheets; brush lightly with 1 Tbsp. margarine, then sprinkle with 1/3 of the trail mix. Repeat all layers twice. Spread with pear mixture to within 1 inch of edges. Roll up jelly roll-style, starting at one short end and removing foil as phyllo is rolled. Place, seam-side down, on parchment paper-covered baking sheet. Brush with remaining margarine. Bake 40 to 45 min. or until golden brown. Cool slightly. Top with sifted icing sugar. Top each serving with 1 Tbsp. thawed Cool Whip Light Whipped Topping. 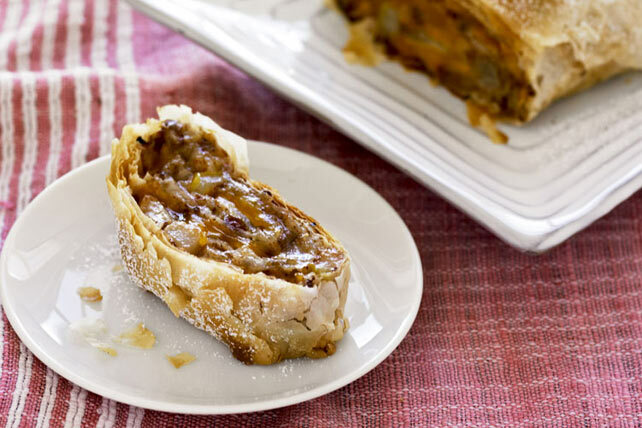 This tasty strudel, made with better-for-you products, can be part of a healthful eating plan.